Quintain has awarded McAleer & Rushe a major construction contract to deliver 553 new homes at Wembley Park. The £130m contract will see the delivery of the second phase of the South West Lands development, following the first phase of works, worth £55m, which is due for completion by the same contractor in Q3 2019. Of the 553 new homes, 114 will be affordable, split between affordable rent and shared ownership. The remaining 439 will be rental homes managed by Quintain’s wholly owned build to rent operator, Tipi. Residents of South West Lands will be able to use a centralised ‘hub’ building as well as an onsite gym, library, resident’s lounge and concierge service leading out to a podium garden. Quintain is leading on the transformation of Wembley Park, one of Europe’s biggest and more ambitious regeneration projects. The South West Lands plot lies adjacent to Wembley Stadium and London Designer Outlet and provides a critical link from Wembley High Road for people visiting Wembley Park and the Stadium. The £130m contract marks McAleer & Rushe’s third contract at Wembley Park and takes the overall contract spend with the contractor by Quintain to £212m. McAleer & Rushe, which celebrated its 50th anniversary last year, is also on site delivering the 312 bedroom Premier Inn hotel which is due for completion ahead of schedule in Summer 2018. The contract signing comes less than two months after Quintain signed their largest ever construction contract for £211m with Sisk to deliver 743 new build to rent homes. Quintain is spending £1m a day on construction making Wembley Park one of the UK’s largest construction sites. 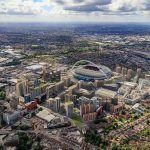 This news follows the announcement, made last year, that Quintain and Network Homes will be delivering an additional 252 new affordable homes at Wembley Park.